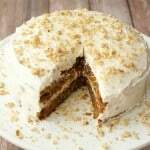 Moist, rich vegan carrot cake with a wholesome flavor and gorgeous color. Topped with lemon buttercream frosting and crushed walnuts. Carrot cake is pretty awesome! It gives you the feeling that you’re eating something pretty darn healthy. I mean you’re getting your veggies in! 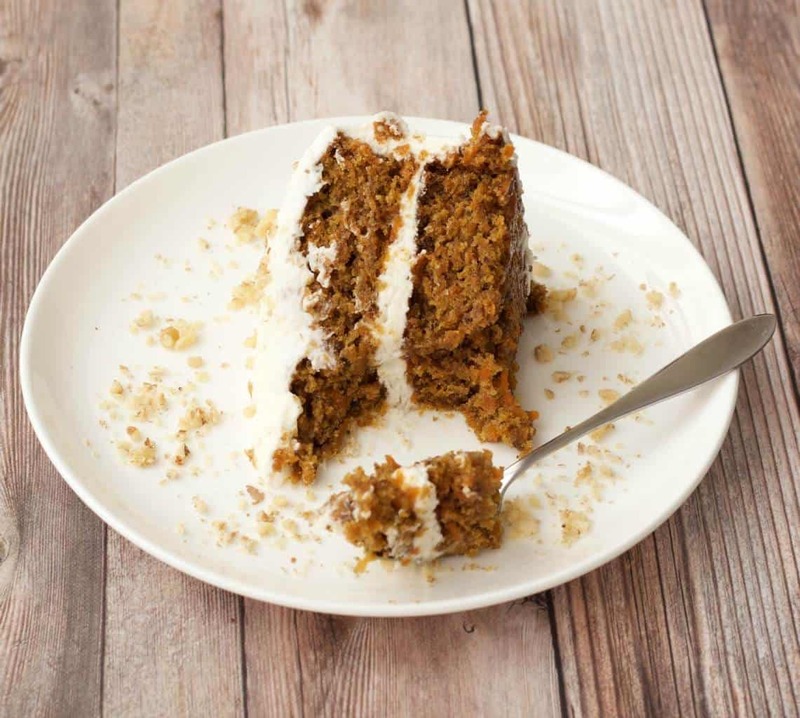 And when it’s vegan carrot cake, well….. then you can feel pretty saintly about it! Ok Ok, I’ve said I’m never going to mention guilt and food in the same sentence on this blog, and I’m going to stick to it, but you know, there’s indulgence and then there’s feeling saintly about indulgence, which is not like indulgence at all really. And you know one of these days I’ll make a gluten-free version and THEN, well then, you know, you can just about ascend to heaven on a cloud while you eat it! 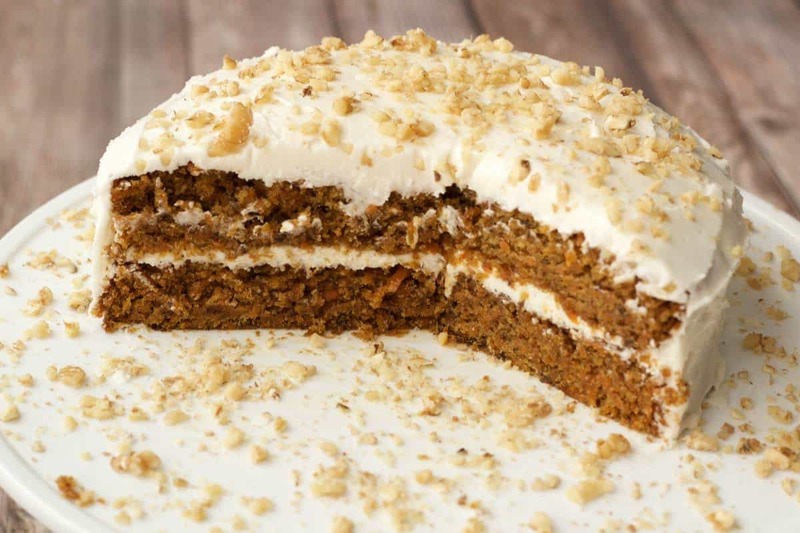 Jokes aside, this carrot cake is super good, it has a wholesome hearty vibe, while being moist, rich, and delicious. Two things: firstly, I frosted it with a slightly altered version of my lemon frosting recipe. In this one I added apple cider vinegar, this was to try and get a slightly more ‘cheesy’ flavor to it. Well, it didn’t really work, it was really good, but I would not say it was in any way ‘cheesy’. It was still really good though, with a perfect amount of tang, so I went with it! 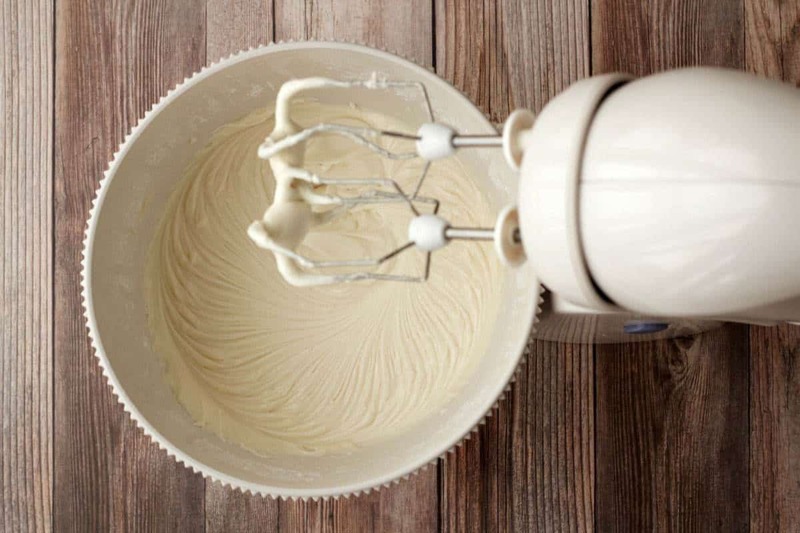 I have since figured out how to make a fabulous vegan cream cheese frosting using a homemade vegan cream cheese! It is seriously delicious, so if you want to give that a try instead, then go for it. Second thing: Every single time I’ve made this I’ve intended to put walnuts in to it. And every single time I’ve forgotten. It’s been in the oven already when I’ve remembered the walnuts. So as you can see, I decorated the top of the cake with crushed walnuts but I just KNOW that walnuts IN the cake itself would be fab too. If I could only just remember! Anyway, if you remember to do it, adding some walnuts in as a final step before transferring the batter to the cake tins would be a great addition to this cake. 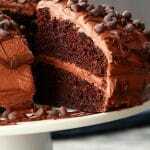 You will love this cake for its moist, rich, wholesome flavor and gorgeous color. Topped with lemon buttercream frosting and crushed walnuts, this cake is ideal for any special occasion. Or just for Sunday afternoon tea. 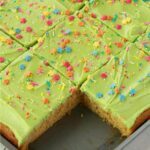 Topped with lemon buttercream frosting! 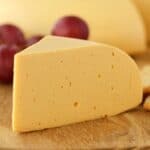 Keep it covered at room temperature where it will stay good for a couple of days, or keep it covered in the fridge where it will stay good for up to a week! There’s something for everyone I reckon! 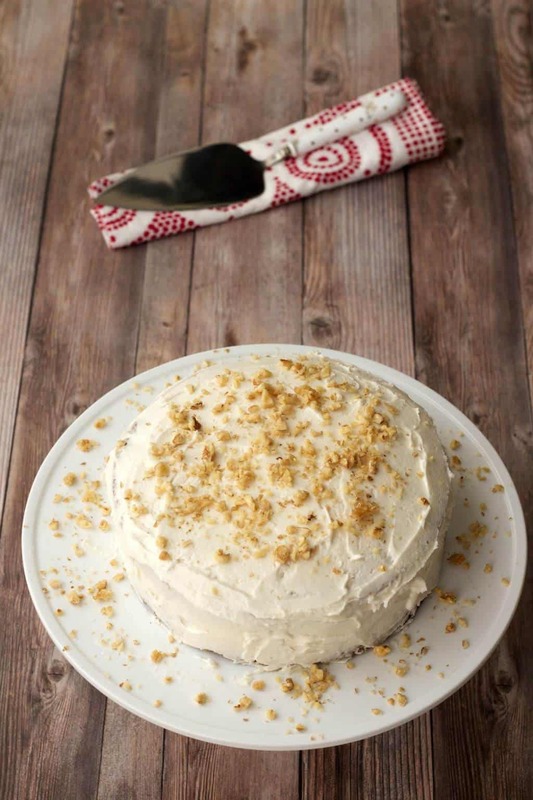 So what do you think of this gorgeous vegan carrot cake? Let me know in the comments and please rate the recipe too, thanks! And while you’re here – sign up for our email list! You’ll get a (free) recipe ebook in the deal and you’ll stay updated with all our latest recipes too! Too tempting am I right? This was my first time ever making carrot cake and it turned out awesome! My husband said it’s the best carrot cake he’s ever had. Definitely making this again and again. I added a little dried ginger to the mix of spices and a few extra carrots. I only had 9″ round pans so I made 1.5 times the recipe. The icing was sooo good too! I plan to make it again for other desserts as well. 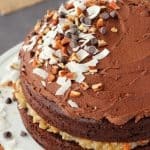 I was looking for a good Vegan carrot cake recipe for quite sometime. I bumped on your website. I thought i will give it a try. What a great recipe! I made this tonight and will make the frosting in the morning.I used a 9×11 pan and it came out perfect. I wanted it to be a bit lower in fat so I did 1/4 c. Olive oil and 1/4 c unsweetened applesause. Worked perfectly! Next time might try all applesauce instead of oil. 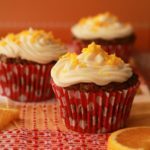 I made this today in cup cake form without frosting…..It’s very good, very moist…..i didn’t added any extra milk…..batter was correct consistency…..i did use one suggestion from reviews and mixed brown sugar in carrot…. I added a bit less sugar and added dried cranberries…. Thank u so much for good recipes…. Turned out to be very tasty. I liked it very much. It is a great cake, however the amount of sugar is huge!! For those who are not interested in avoiding big amounts of sugar (as I am) this is the perfect recipe! P.S. My icing is a bit weird but this is because my sugar wasn’t really ‘icing sugar’. It was the first cake of your blog that I made. I divided the sugar and the oil by two and used a cake mould and that worked perfectly fine though it took quite a long time to cook. It was a total success; my colleagues really liked it (though none of them are vegan). So then, I made your vanilla cake. Then your red velvet cake. I don’t know when I will stop. I shared your recipe with the vegan club of my college which made it for the presentation of the club and it was such a success that they sent the recipe to their whole mailing list. 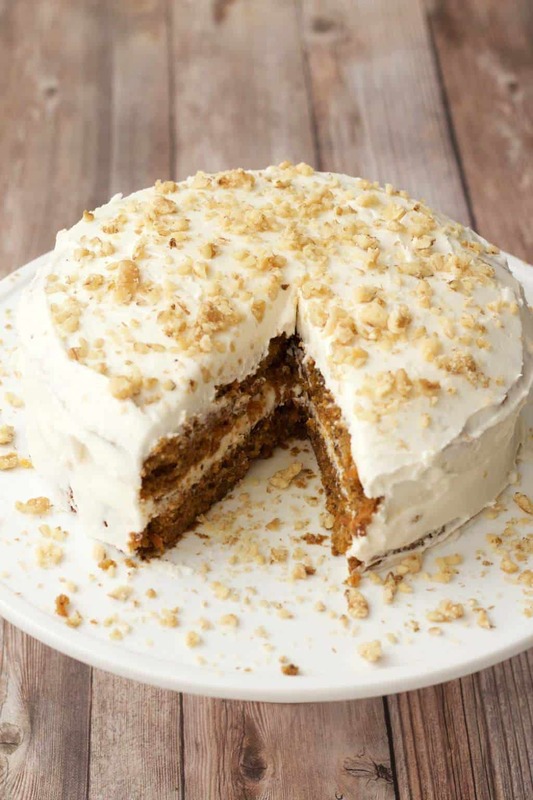 This is seriously the best carrot cake ever! All the non vegans loved it, too. I made it exactly as your recipe except since I had no vegan butter I used coconut oil which worked great and I think it’s way better than cream cheese frosting. I am printing this out so I can find it easily to make it again. Thank you! I baked this cake for my son’s first birthday and everyone loved it. 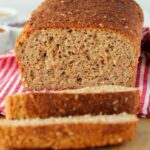 I was looking for an easy vegan recipe with very few new ingredients, so don’t expect this to turn out so soft and delicious. Thank you for a recipe I will use several times again! I just wanted to say this cake is beyond wonderful. I made it for my best friend for her birthday and it was a hit. My boyfriend has actually asked me to make it again for him to take to his firehouse. I told him it is only for special occasions and he isn’t aware of it yet, but he is getting it sent to the firehouse on Saturday which is his birthday! Thanks for the great recipe. I altered your recipe into gluten free style, and used a “cream cheese” made by ‘hang op’ vegan yogurt. Adding vegan butter and powdered sugar with touch of lemon juice and zest, worked fabulous! Thank you for sharing your recipe and experience. I have an old carrot cake recipe I’ve used for years that I got out of Bon Appetit Magazine. It was a show stopper, 3 9-inch layers with lemon cream cheese frosting. Since going vegan a year ago, I’m always exploring new ways to make my old favorites. This recipe does not disappoint. The only thing I did differently was use whole wheat pastry flour. This too is a show stopper. And very fun as cupcakes as well! I just made this cake and overall love it as it’s so simple and really moist, but I found it really sweet. I only had 150g of brown sugar at home, so I added 100g of white sugar and it turned too sweet for me. I’ll definitely make it again but maybe next time I’ll use pineapple instead of the white sugar part and stick to 150g of brown sugar. Still, thank you so much for this recipe as I love cakes that I can make in almost no time and without any weird ingredients! Made this for a birthday and it went down so well! Would perhaps use less buttercream next time (personal preference) but this was probably the best carrot cake I’ve ever had. 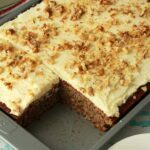 The walnuts were a wonderful addition and you could really taste the spices in the cake. Hi, made this cake, but unfortunately my pans are 9 inches …so I didn’t bake them as long, and of course they were a bit flat…nonetheless, a lovely moist cake ! 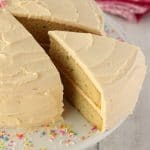 My question, if you don’t mind, for bakers from other regions (like New Zealand, where we use metric system), and where “vegan butter” is not available, could you possibly recommend a recipe for frosting containing basic ingredients such as coconut cream/oil perhaps? Hi Delia, you can get Nuttelex in New Zealand as far as I know (it’s an Australian brand that is also available elsewhere) and that is an awesome vegan ‘butter’ option. I used it all the time when I lived in Dubai and it is great for all our recipes calling for vegan butter. You can also make your own vegan butter and we do have a recipe for it. I don’t consider it as good for frostings as regular ‘store-bought’ vegan butters because it firms up too much in the fridge and can get too soft at room temperature in warm weather, because the base is coconut oil. However, some people have just swapped out the vegan butter for straight coconut oil in our frostings too and been happy with the result. Thank you for that ! I’ll have a look around for that vegan butter and also try coconut oil and see how it works ! 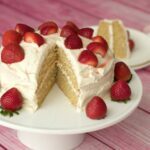 hi my friend and i made this cake just now – FABULOUS RECIPE! We actually used chia eggs instead of the flax and oranges instead of the lemon and we also put toasted coconut and pumpkin seed on the top as I have a nut allergy- it worked out very well and I would recommend to all those nut free vegans out there! Made this for my vegan daughter’s birthday. Well recieved and super tasty! No pic because it was utterly consumed before I had a chance. I too had the dry batter issue. Canadian all-purpose flour is harder than American, and I expected it. Adding a little rice milk did the trick. Next time I may try adding apple sauce or crushed pineapple to up the flavour and nutrition. Loved this! Ssoooo delicious and moist! I added non vegan cream cheese to one of the layers for my non vegan husband and I ate just the cake no frosting and it didn’t even need any! I loved it, thank you so much for this recipe! i want to make this cake on the weekend for a birthday. Do you think I could make a icing out of coconut cream? I am interested in making this recipe for my husband who is now vegan. Instead of flax eggs can I use the ener g egg replacer??? This is the second of your cakes I’ve made. It was a huge hit for my mother-in-love’s 88th birthday. I had to add quite a bit of water but I suspect that’s because I did not weigh the flour. I made 1.5x the recipe as I had larger pans but did not increase sugar. Thank you Alison! 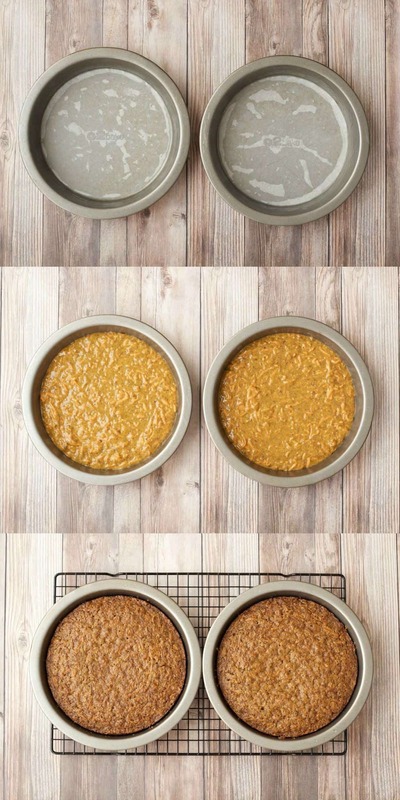 You cake recipes are awesome.